With the torrential rains that have plagued the Tampa Bay Area the past three weeks, unfortunately many homes – mainly in South Tampa and Pasco County – have suffered bad floods with property damage. We’ve had many calls regarding flooded rugs that have been soaked. 1) Move your rug to a dry area. If the rug is large and it is soaked, it will probably weight a lot! Extract as much water from it as soon as possible. 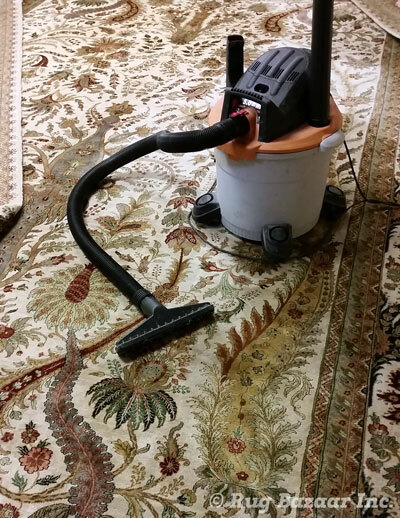 Use a wet/dry shop vac to extract the water from the face of the rug. 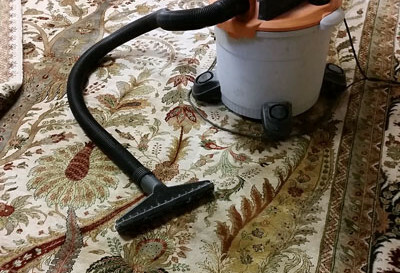 Run the vacuum nozzle back and forth with the grain – or nap – of the rug. In other words, don’t go in random circular motions. The nap typically runs north and south the length of the rug. 2) To prevent color bleeding, blot it with towels spread on it, and walk on the towels to absorb the moisture. 3) Do NOT hang the rug, as this may cause the colors to bleed and run down the rug. 4) Keep the rug flat on a dry spot. Flip it over from time to time for faster drying. Using a fan would help speed up the drying process. 5) Have the rug professionally cleaned. Contact us or call (727) 726-8787 to make arrangements.